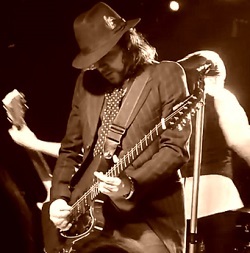 A member of the band since 1989 he has played on every Quireboys album. When the band split in 1993 Griff moved to the US and formed and fronted the band Glimmer who released the album ‘Silver Zone’ on Atlantic records in 1999. Relocated to the UK to reform the Quireboys in 2001 for the album’This is Rock n Roll. From the Stones to Bowie , Tom Petty, the Band or Johnny Cash he has wide ranging musical influences in songwriting . Recent side projects have included the Los Angeles based country rock band The Deserters who released the album ‘Riding the Belly ‘ in 2012 and Joe Elliotts Down n Outz who released ‘My ReGeneration’ in 2010.